Oh, how I wish The Center for Puppetry Arts had shared some press pics of their stunningly gorgeous sets so I could include one in this blog post! We just got back from seeing The Little Pirate Mermaid and it was one of the most visually stunning shows I’ve ever seen. Not that the marionette puppets weren’t gorgeous–you can see that they are. But the underwater scenes were just so beyond lovely, I caught myself smiling without even meaning to! I guess the lack of photos means that you’re just going to have to go see the show for yourself, which I say is a fantastic way to spend a summer morning or afternoon with your kids. 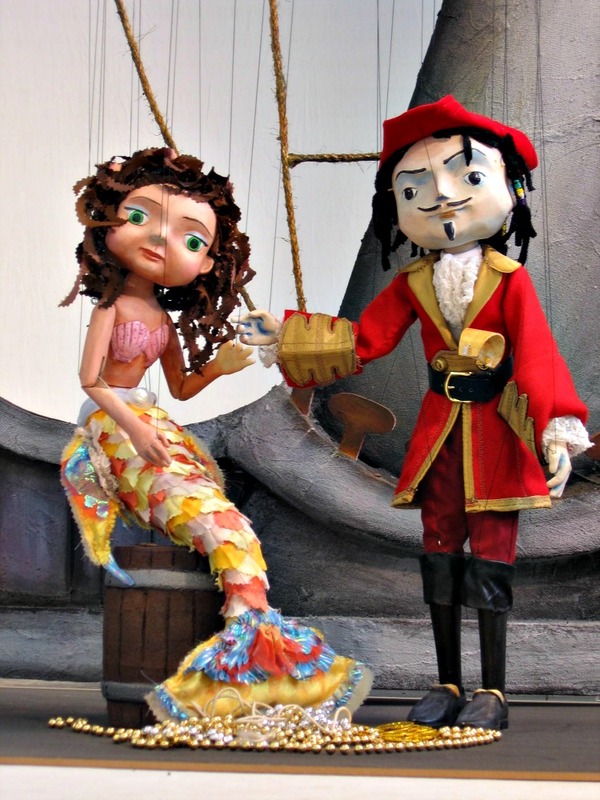 Based on the classic tale by Hans Christian Andersen, Artistic Director Jon Ludwig shows off his imagination through many entertaining twists, including rhyme, songs and a surprising goal that Molly the Mermaid brings to the pirate crew. Humor is sprinkled throughout, mostly through the use of pirate-y puns. My favorite was the scene that opened with the pirates singing “KumbayAAARRRR”! Too funny! Tuesday – Friday: 10:00 a.m. and 12:00 p.m.
Saturday: 11:00 a.m., 1:00 p.m. and 3:00 p.m.
Sunday: 1:00 p.m. and 3:00 p.m. Please note that there aren’t any performances on July 3rd, but the museum and workshops are still open. The Center is closed on July 4th. Tickets include museum admission, which is something really neat to see, especially for Jim Henson fans. Guests can also go to the Create-A-Puppet Workshop after the show and make a really cool stingray marionette puppet to take home. And those sets! Oh my. Please tell me you’ll go just to get lost in those gorgeous underwater scenes?